The Sony Xperia T3 phonebook is integrated with the dialer using a tabbed interface - the Contacts, Phone, Favorites and Groups tabs can be side-swiped. The contact list has a dedicated search filed plus it offers and an alphabetical scroll bar. You can sync with multiple accounts, including Exchange and Facebook, and you can selectively show or hide contacts from some accounts (as well as filter specific groups in an account), or set the phonebook to display only contacts with phone numbers or only contacts that are online. Linking contacts is available, quick contact feature is here too. Receiving and making calls on the Xperia T3 was nothing short of pleasing. There is noise-cancelling options that is on by default, but you can turn it off from Settings. There is also a Slow Talk option, which will actively slow the speech of the other calling party. You can even apply equalizer settings, but you can choose only between Normal, Bright and Smooth. The dialer support smart dialing. Sony Xperia T3 scored a Good mark in our loudspeaker tests, meaning you are unlikely to miss some calls and notifications if you are in a noisy environment. Sony has preloaded a number of features that modify how the speaker sounds. We tested with all of them off, then with xLOUD on, but that made very little to no difference. Text messages and MMS use standard thread layout. Adding multimedia (photos, videos, sounds, etc.) will convert the message automatically into an MMS. Naturally the Gmail client and the default Email apps are onboard. Gmail can sync only with (multiple) Google accounts, while the generic Email app can handle POP and IMAP and offers a Combined inbox. 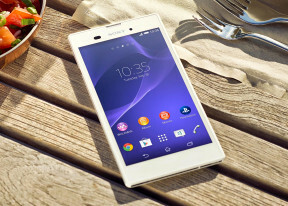 As for text input, the Xperia T3 offers a customizable on-screen full QWERTY keyboard. You can choose a different layout (keypad, QWERTY, QWERTY with extra symbols), add/remove the coma and period button, the smiley and voice input buttons and also enable things like bilingual word suggestions if you have more than one language enabled. Different keyboard skins are available too. You can also try the so-called Gesture input if hitting those keys individually doesn't give you the desired typing speed. It's similar to Swype, and even if you've never used a Swype-like input before, you'll quickly get used to it. Single-hand size keyboard is available too, but only in portrait orientation. If enabled, it squeezes the onscreen keyboard to the left or right side of the screen so it gets more comfortable for single handed text input.